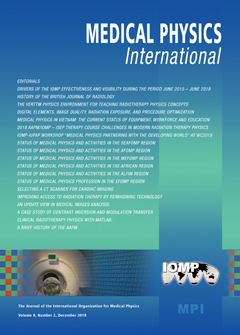 The MPI Journal is now soliciting papers on topics in the education/training of medical physicists and on topics related to medical physics professionalism and professional activities and concerns. Papers should be up to 10 journal pages (approximately 8000 words reduced by the space occupied by tables and illustrations). Papers should be presented as Word documents and should include an unstructured abstract of no more than 100 words. MPI also invites abstracts of Medical Physics PhD theses (up to 200 words per PhD these). A template for the Journal is available from the MPI web site.